We often take our health for granted. We push ourselves to achieve more and more and feel bitter when for some reason we don’t accomplish all we set out to. But without good health, our plans go down the drains. This afternoon, I remembered the terminally ill (those suffering from life-threatening conditions, those the doctors have given up on) who are still hoping for a touch from God so that they can pursue their dreams. And I wrote this prayer for them. May the promise of the Scriptures that we are healed by the stripes of Jesus speedily come true for them. And for the rest of us, may this piece cause us to show more care to the severely sick around us and return thanks continually to God for keeping us strong. In Jesus’ name I pray. Amen. Although i do not have any health challenge, (and by his grace have not had any for more than a year now) but I know there are plenty others out there who are helplessly lying in hospitals and homes due to health challenges. I therefore join in the prayer for divine healing upon such people in Jesus' name believing that the promise of God in John 14:14 will not be left unfulfilled. I also pray God to protect my family,Classmates, lecturers, friends, and the entire University Community against any form of illness or any act that will lead to illness including Bad Government or life-threatening administration Amen. You're blessed, Chinagorom! Amen to your prayer in Jesus' name. That last dig, Lol! Yes, because he bore our sicknesses on the cross. Praise the Lord! And bless you, Amarachi! Hi Edith! Beautiful poem! It breaks my heart to see His children suffer. It broke our Savior's heart as well, for He healed them all! He commissioned us as Believers to walk out Luke 4:18, preaching the Good News to all who will hear and letting them know they can experience wholeness in Him! Such comforting words for those who are suffering. Stopping by from "Christian Women Bloggers Unite." Blessings! Thans a lot, Michell! I appreciate. Blessings on your endeavours for the kingdom in Jesus' name. I don't know how they cope but God is able. It makes me so so grateful and yes, we ought to pray for them, every chance we get. Blessings on you, your ministry and family, Marie! Thank you, Demelza! You are blessed! This reminds me about one of the songs of my role model in the music industry, Don Moen, ''God's name is more powerful than any disease we can name (tonight) ''I am the Lord that healeth thee'', I wish them all that has one health challenge or the other God's healing touch in Jesus name, Amen! For me, am in need of God's healing in my life. Earnestly praying and waiting on him. Blessed by this post. May the Lord visit you and renew your health totally in Jesus' name. Amen. Healing is thy children's bread. We should thank God for the good health we have each day. Amen to the prayer cause I need healing in every area always not just being free from sickness. Graceful. Amen. Am really happy that the sick is being remembered. Actually we are all sick whether you or I think so or not but to those their sickness is truly visible, God grant them quick recovery. So many times, we've enjoyed good health for free, without paying any charges, yet we don't know what God gave to us. My prayer goes out to everyone suffering from any type of sickness and disease, receive supernatural healing now, in Jesus name! For those that are sick, remember that God is your healer, he can heal you of any kind of disease just trust in him, have this in mind, when there is life there is hope. Lord I am so grateful for the good health you have given to him and I ask that you do not relent in doing this. This is my healing prayer to my friend who is critically down Think, o God, of my friend who is ill, whom i now commend to Your compassionate regard. Comfort him upon his sickbed, and ease his suffering. i beg for deliverance, and submit that no healing is too hard for the Lord, if it be His will. i therefore pray that You bless my friend with Your loving care, renew his strength, and heal what ails him in Your loving name. Thank You, Lord. faith is the most powerful weapon we have as Christians. We should learn to pray without season, not just when we need healing. At times when sick, i hardly pray for healing because i know am already healed. 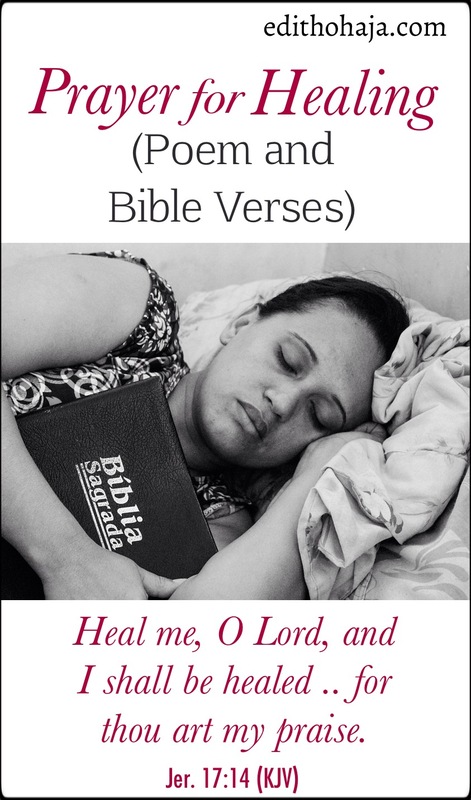 I have eternal sound health in Christ and when sick, i rather thank Him for my healing. God is the greatest physician. He has healed me when sickness came and I pray that His divine healing be upon the sick . Amen. My healer, my great physician is what i call him; even the best doctors still look to him for direction. In any ailment at all, I know he is in control. We are anxious to get up and doing, trying to do a thousand things without noticing the tiny things that need care, our health. stop fighting and worrying, start living. God, you are the Lord that healeth thy people.I ask that you will stretch forth ur healing hands upon every sick person .God is the greatest physician. His healing powers suppercceds every other powers. What an inspiring piece, most times people complain about little things forgeting that their are some people who are in the hospital, others who can't breathe. The healthy should always appreciate God for good health. This is really a faith piece. Prayer can do things. I remember that it was through my prayer and faith in God that my dad got healed of a mysterious illness. Thank you Jesus. i want to use this medium to thank God for good health for me and my family and for all who are going through one health challenge or the other, i pray that the good Lord will grant them good health in Jesus mighty name Amen.